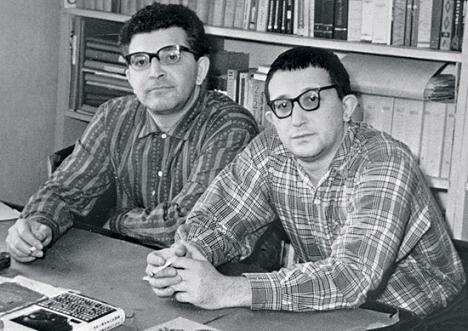 There is something about these two Russian brothers: They wrote the simply most incredible science fiction novels. I am thinking particularly of Roadside Picnic (Пикник на обочине), writen in 1972. At some time in the past, parts of Earth were visited by one or more bands of interstellar travelers. They left their mark on the places they have stayed—in strange, unaccountable ways. Nowhere is there a description of the visitors: no one alive has ever seen them. But the laws of matter and energy don’t seem to work there any more. The novel was turned into a film by fellow Russian Andrei Tarkovsky in 1979. The film was called Stalker, and it was one of the greatest films produced anywhere in that decade. The film so influenced Geoff Dyer that he wrote a book in 2012 called Zona about his memories of the movie. This is some powerful stuff. Those two brothers had some freaky visions that could so influence so many follow-on works. I am currently reading one of their earlier works, Space Apprentice (Стажеры) (1962). It’s not quite the level of Roadside Picnic, but it is fascinating. While we’re on the subject of Eastern European sci-fi writers, I thought I’d put in a word for Poland’s Stanisław Lem , author of Eden (1959). In that novel, the earthling explorers go to a strange new world, where they are ignored. The protagonists can make nothing whatsoever of the local inhabitants. This entry was posted in reading and tagged books, lem, science-fiction, strugatsky. Bookmark the permalink. I’ve read Roadside Picnic and watched the film once I found out it was based on the novel. I even did a post on the film and novel. I haven’t read that one by Lem, but I have read his Solaris and The Futurological Congress. If you haven’t read Solaris yet, I would recommend it. There are two film versions: the one directed by Andrei Tarkovsky (1972) is much better than the one directed by Soderbaugh, which stars George Clooney. By the way, M. John Harrison’s Nova Swings, published in 2006, has a similar premise. A place visited by aliens violates all sorts of laws of physics and so on. I’ve read Solaris and seen the Tarkovsky film.